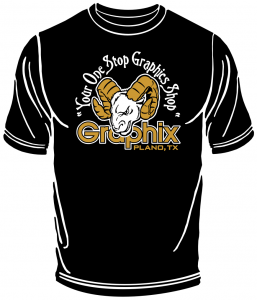 t-shirt history - RAMGraphix, Inc.
A T-shirt (or tee shirt, or tee) is a style of unisex fabric shirt, named after the T shape of the body and sleeves. It is normally associated with short sleeves, a round neck line known as a crew neck, with no collar. T-shirts are generally made of a light, inexpensive fabric, and are easy to clean. Typically made of cotton textile in a stockinette, or jersey, knit, it has a distinctively pliable texture compared to shirts made of woven cloth. The majority of modern versions have a body made from a continuously woven tube, on a circular loom, so that the torso has no side seams. 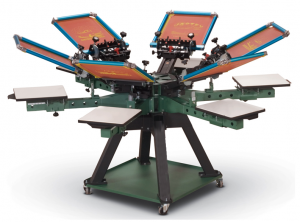 The manufacture of T-shirts has become highly automated, and may include fabric cutting by laser or water jet. The T-shirt evolved from undergarments used in the 19th century, and in the mid-20th century transitioned from undergarment to general-use casual clothing. A V-neck T-shirt has a V-shaped neckline, as opposed to the round neckline of the more common crew neck shirt (also called a U-neck). V-necks were introduced so that the neckline of the shirt does not stand out when an outer shirt is worn over it, thus reducing or eliminating the visible cloth above the outer shirt of a crew neck shirt. These were a crew-necked, short-sleeved, white cotton undershirt to be worn under a uniform. It became common for sailors and Marines in work parties, the early submarines, and tropical climates to remove their uniform jacket, wearing (and soiling) only the undershirt They soon became popular as a bottom layer of clothing for workers in various industries, including agriculture. The T-shirt was easily fitted, easily cleaned, and inexpensive, and for those reasons it became the shirt of choice for young boys. Boys’ shirts were made in various colors and patterns. The word T-shirt became part of American English by the 1920s, and appeared in the Merriam-Webster Dictionary. By the Great Depression, the T-shirt was often the default garment to be worn when doing farm or ranch chores, as well as other times when modesty called for a torso covering but conditions called for lightweight fabrics. Following World War II, it became common to see veterans wearing their uniform trousers with their T-shirts as casual clothing. The shirts became even more popular in the 1950s after Marlon Brando wore one in A Streetcar Named Desire, finally achieving status as fashionable, stand-alone, outerwear garments. Often boys wore them while doing chores and playing outside, eventually opening up the idea of wearing them as general-purpose casual clothing. 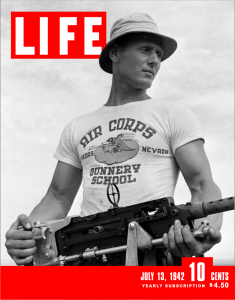 Printed T-shirts were in limited use by 1942 when an Air Corps Gunnery School T-shirt appeared on the cover of Life magazine. In the 1960s, printed T-shirts gained popularity for self-expression as well for advertisements, protests, and souvenirs. Current versions are available in many different designs and fabrics, and styles include crew-neck and V-neck shirts. T-shirts were originally worn as undershirts, but are now worn frequently as the only piece of clothing on the top half of the body, other than possibly a brassiere or, rarely, a waistcoat (vest). T-shirts have also become a medium for self-expression and advertising, with any imaginable combination of words, art and photographs on display. A T-shirt typically extends to the waist. Variants of the T-shirt, such as the V-neck, have been developed. Hip hop fashion calls for tall-T shirts which may extend down to the knees. Long T-shirts are also sometimes worn by women as nightgowns. A 1990s trend in women’s clothing involved tight-fitting cropped T-shirt or crop tops short enough to reveal the midriff. Another less popular trend is wearing a short-sleeved T-shirt of a contrasting color over a long-sleeved T-shirt, which is known as layering. T-shirts that are tight to the body are called fitted, tailored or baby doll T-shirts. The rise of online shopping in the early-to-mid-2000s caused a proliferation of new T-shirt ideas and trends. While several brick-and-mortar chains included these items in their inventories, many of these shirts were pioneered by online start-ups. Innovations included the flip-up T-shirt, which the wearer can lift and stretch over their head to display an interior print, and all-over print clothing. With the rise of social media and video sharing sites also came numerous tutorials on DIY T-shirt projects. These videos typically provided instructions on how to modify an old shirt into a new, more fashionable form. One of the earliest examples of T-shirts with a logo or decoration can be found in the 1939 film The Wizard of Oz. 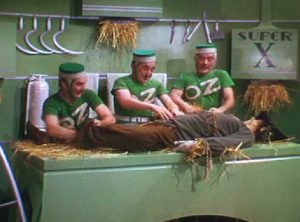 Three men attending to the Scarecrow at the Wash & Brushup Company in Emerald City are seen wearing green T-shirts with the word “Oz” printed on the fronts. In the early 1950s, several companies based in Miami, Florida, started to decorate T-shirts with different resort names and various characters. The first company was Tropix Togs, under founder Sam Kantor, in Miami. They were the original licensee for Walt Disney characters in 1976 including Mickey Mouse and Davy Crockett. Later, other companies expanded into the T-shirt printing business, including Sherry Manufacturing Company, also based in Miami. Sherry, started in 1948 by its owner and founder Quinton Sandler as a screen print scarf business, evolved into one of the largest screen printed resort and licensed apparel companies in the United States. In the 1960s, the ringer T-shirt appeared and became a staple fashion for youth and rock-n-rollers. 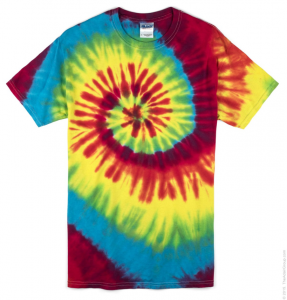 The decade also saw the emergence of tie-dyeing and screen-printing on the basic T-shirt and the T-shirt became a medium for wearable art, commercial advertising, souvenir messages, and protest art messages. Psychedelic art poster designer Warren Dayton pioneered several political, protest, and pop-culture art printed large and in color on T-shirts featuring images of Cesar Chavez, political cartoons, and other cultural icons in an article in the Los Angeles Times magazine in late 1969 (ironically, the clothing company quickly cancelled the experimental line, fearing there would not be a market). In the late 1960s, Richard Ellman, Robert Tree, Bill Kelly, and Stanley Mouse set up the Monster Company in Mill Valley, California, to produce fine art designs expressly for T-shirts. Monster T-shirts often feature emblems and motifs associated with the Grateful Dead and marijuana culture. Additionally, one of the most popular symbols to emerge from the political turmoil of the 1960s were T-shirts bearing the face of Marxist revolutionary Che Guevara. Today, many notable and memorable T-shirts produced in the 1970s have become ensconced in pop culture. Examples include the bright yellow happy face T-shirts, The Rolling Stones tops with their “tongue and lips” logo, and Milton Glaser’s iconic “I ♥ N Y” design. In the mid-1980s, the white T-shirt became fashionable after the actor Don Johnson wore it with an Armani suit in Miami Vice. 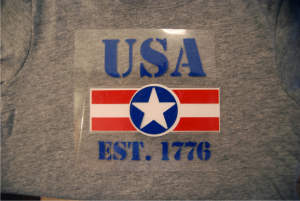 The most common form of commercial T-shirt decoration is screen-printing. In screen-printing, a design is separated into individual colors. Plastisol or water based inks are applied to the shirt through mesh screens which limits the areas where ink is deposited. In most commercial T-shirt printing, the specific colors in the design are used. 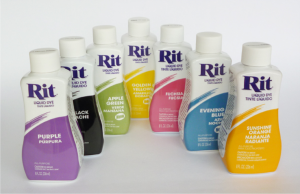 To achieve a wider color spectrum with a limited number of colors, process printing (using only cyan, magenta, yellow and black ink) or simulated process (using only white, black, red, green, blue, and gold ink) is effective. Process printing is best suited for light colored shirts. Simulated process is best suited for dark colored shirts. In 1959, the invention of plastisol provided an ink more durable and stretchable than water-based ink, allowing much more variety in T-shirt designs. Very few companies continue to use water-based inks on their shirts. The majority of companies that create shirts prefer plastisol due to the ability to print on varying colors without the need for color adjustment at the art level. Specialty inks trend in and out of fashion and include shimmer, puff, discharge, and chino based inks. A metallic foil can be heat pressed and stamped onto any plastisol ink. When combined with shimmer ink, metallics give a mirror like effect wherever the previously screened plastisol ink was applied. Specialty inks are more expensive to purchase as well as screen and tend to appear on garments in boutiques. Other methods of decoration used on T-shirts include airbrush, applique, embroidery, impressing or embossing, and the ironing on of either flock lettering, heat transfers, or dye-sublimation transfers. 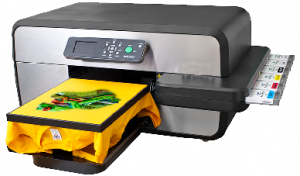 Laser printers are capable of printing on plain paper using a special toner containing sublimation dyes which can then be permanently heat-transferred to T-shirts.In the 1980s, thermochromatic dyes were used to produce T-shirts that changed color when subjected to heat. The Global Hypercolour brand of these was a common sight on the streets of the UK for a few years, but has since mostly disappeared. These were also very popular in the United States among teenagers in the late 1980s. A downside of color-change garments is that the dyes can easily be damaged, especially by washing in warm water, or dye other clothes during washing. hippie movement, a time when the Vietnam War was being heavily protested. spray paint, and many more. Some techniques that can be used include sponging, stenciling, daubing, stamping, screen printing, bleaching, and many more. Since the 1980s, T-shirts have flourished as a form of personal expression. Screen printed T-shirts have been a standard form of marketing for major consumer products, such as Coca-Cola and Mickey Mouse, since the 1970s. However, since the 1990s, it has become common practice for companies of all sizes to produce T-shirts with their corporate logos or messages as part of their overall advertising campaigns. Since the late 1980s and especially the 1990s, T-shirts with prominent designer-name logos have become popular, especially with teenagers and young adults. These garments allow consumers to flaunt their taste for designer brands in an inexpensive way, in addition to being decorative. Examples of designer T-shirt branding include Calvin Klein, FUBU, Ralph Lauren, American Apparel, and The Gap. These examples also include representations of rock bands, among other obscure pop-culture references. Licensed T-shirts are also extremely popular. Movie and TV T-shirts can have images of the actors, logos, and funny quotations from the movie or TV show. 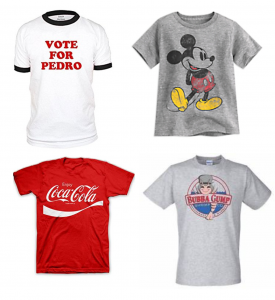 Often, the most popular T-shirts are those that characters wore in the film itself (e.g., Bubba Gump from Forrest Gump and Vote For Pedro from Napoleon Dynamite). Designer Katharine Hamnett, in the early 1980s, pioneered outsize T-shirts with large-print slogans. The early first decade of the 21st century saw the renewed popularity of T-shirts with slogans and designs with a strong inclination to the humorous and/or ironic. The trend has only increased later in this decade, embraced by celebrities, such as Britney Spears and Paris Hilton, and reflected back on them, too (‘Team Aniston’). The political and social statements that T-shirts often display have become, since the first decade of the 21st century, one of the reasons that they have so deeply permeated different levels of culture and society. The statements also may be found to be offensive, shocking, or pornographic to some. Examples of T-Shirt stores and designers known for using offensive and shocking messages include T-Shirt Hell and Apollo Braun. Many different organizations have caught on to the statement-making trend, including chain and independent stores, websites, and schools. A popular phrase on the front of T-shirts demonstrating the popularity of T-shirts among tourists is the humorous phrase “I did _____ and all I got was this lousy T-shirt.” Examples include “My parents went to Las Vegas and all I got was this lousy T-shirt.” T-shirt exchange is an activity where people trade the T-shirts that they are wearing. Artists like Bill Beckley, Glen Baldridge and Peter Klashorst use T-shirts in their work. Models such as Victoria Beckham and Gisele Bundchen wore T-shirts through the 2000s. Paris Fashion Week 2014 featured a grunge style T-shirt. Contemporary T-shirt designers like Balmain and Street People Atelier produce new styles of T-shirts.